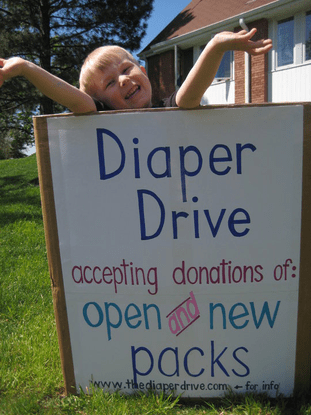 Will you host a diaper drive? Diaper Drives are one of the key ways that the Diaper Bank of Minnesota gets diapers to provide to our partner agencies. We’re glad you’re considering hosting a diaper drive! Check out the Diaper Drive Toolkit! We’ve created a lot of resources to help you host a successful diaper drive. Check out this toolkit for flyers, email templates and more! Everyone is part of a group that could host a very successful diaper drive! Have you thought about hosting a drive at any of these places? And you don’t have to pick just one! Our volunteers have hosted simultaneous diaper drives at their office and children’s daycare centers at the same time. If you’ll be able to set up a collection bin where lots of people get together, you can host a diaper drive! There’s no wrong way to host a diaper drive, but we have some suggestions to help you be most successful. Enlist other people to help you! When more of you are asking your networks to get involved, you’ll be able to collect more diapers. Pick a date in the next month or so for your diaper drive. Let us know about it! We can help you get the word out about your diaper drive.